Clint Eastwood directed two films about WWII. First, there was Flags of Our Fathers, about the young American soldiers who were sent to Iwo Jima and returned to find that a photo had been taken of soldiers placing a flag on Iwo Jima, a photo mistakenly thought to be of them. 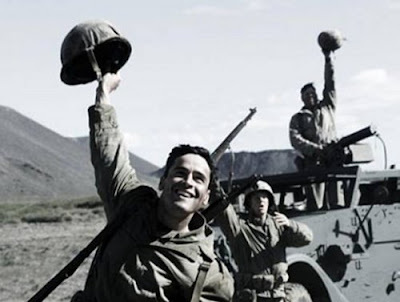 The film (below) focuses on their consciences about this event, and the mistake, and on the American perspective of the Battle of Iwo Jima. 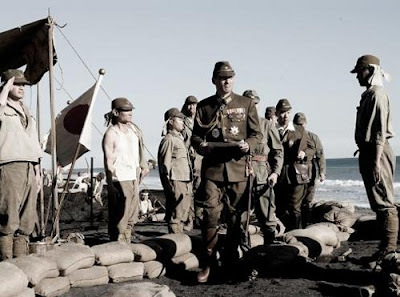 Then Eastwood made Letters From Iwo Jima, in Japanese, about the Japanese soldiers who fought in the exact same battle of Iwo Jima - from their perspective (below). The viewer already knew what was going to happen, but he or she would see the same events through altogether different eyes, in a different context. In my cello concerto, Divining Apollo (below), the first two movements contain wild repeated patterns played by the members of the ensemble, against a cello part which is serene and fragile (based on overtones/harmonics) and continuous and also largely covered up by the other players. It is confusing because the listener can see that there are significant gestural patterns in the soloist's part, but it is not clear what these patterns are, or if they are important thematically, or what the foreground of the piece actually is. Then, there is an intermission - a break in the entire programme of the concert. The audience goes out of the hall and has a drink, or a conversation, etc. After the intermission of the concert, the remaining two movements of the piece are played. 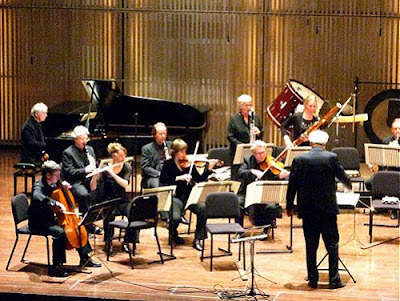 All of the notes and rhythms are taken from the notes and rhythms of the first half of the concert, but the dynamic levels have changed, the conductor's groupings of the measures have changed, and the seating position of the soloist has radically changed. This half of the piece is, then, a true "concerto," in that the soloist's perspective is clear and prominent, and his material can finally be understood by the listeners (who have "heard it all before" a half hour earlier in the part before the intermission). Just as the god Apollo could see into the future, the illumination, or light, which is shone on the cellist's material in the second half of the piece allows for an understanding/realization of what has been occurring in the piece all along. The cellist's part before the intermission had been " divining" what would come, but the listeners had probably been more occupied with the raucous, Dyonisian, gestures of the ensemble players. As in Clint Eastwood's films, both parts can stand on their own as individual pieces, although the meaning behind what makes the piece a "concerto" must come from the experience of the two back to back. It's like the first half is, actually, a "prequel" to the real "Apollo," which comes if you stay around until after the intermission. 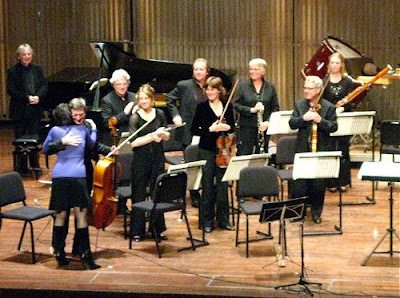 Programme note by composer Vanessa Lann (left of photo 4) for her new Cello Concerto Divining Apollo, which was given its first performance by Hans Woudenberg with Reinbert de Leeuw and the Schoenberg Ensemble at the Amsterdam Cello Biennial on October 23rd. Review in Dutch here. 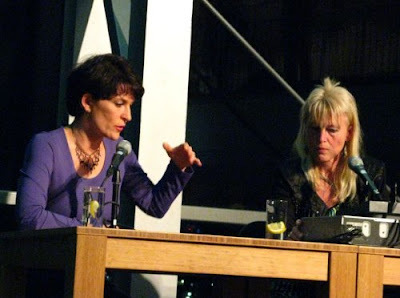 The photos by Patricia Werner Leanse were taken at the Amsterdam performance. The third photo down shows the placement of the cellist while playing in the second movement of the piece immediately before the intermission. For the first movement the cellist sat among the other players, and for the third movement after the intermission he sat on the other side, and in the concluding movement took the conventional soloist's place, next to the conductor. The solo cello part also became increasingly 'soloistic' with each new position. In photo 4 Vanessa is explaining to the musicologist Thea Derks the advantages of listening with innocent ears. That's three cheers for contemporary music.